Tablet PC is a special class of devices. In my opinion, it's a good hybrid, because such computers successfully combine all functions of a small notebook (with a case for a 12" display) and a digitizer. At the same time, these devices are not very popular on the market. Why does it happen? It seems to me that Tablet PCs are a subspecies of ultra-slim notebooks (models with 12" displays as a rule). All design peculiarities of these notebooks are typical of them as well. They include usual design trade-offs (a TabletPC is even more difficult to put together than a usual notebook of this class), modest bundles, some peculiarities of ergonomics due to a small case, higher prices. The target audience of ultra-slim notebooks is not big, TabletPCs have even fewer users. However, they still have their audience. It's usually professionals, who know well what functionality they need and who spend much time in travels or at least not at their desks. People who know what functions they need, what functions are useful, and what functions are not necessary. These people have strict requirements to the bundle, ergonomics, and notebook case ("bright LEDs" do not belong here). It's very difficult to please such users, a bad model with evident drawbacks will not survive on this market. These people are ready to pay much, but they want to know what exactly they pay for. 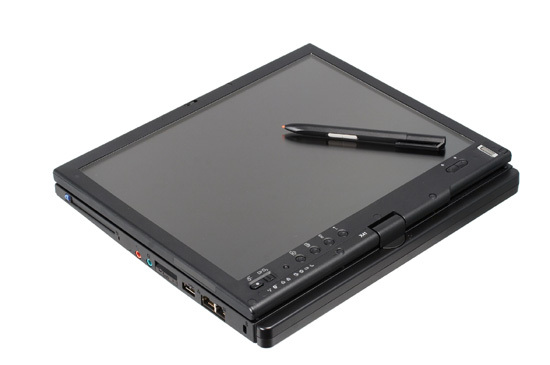 Lenovo X41 Tablet (it was designed by IBM) was launched much later than its class-mates and competitors. On one hand, it bad, because the first wave of demand for a new product has already passed, the market has more or less settled down. On the other hand, engineers had more time not only to design, but also to take into account the main problems of competing products and tried to fix them in the new product. Not the least of the factors is that IBM clients are ready to wait for a product in order to get the desired quality and ergonomics, they got used to. In this article we are going to see how good the X41 tablet is. Lenovo X41 Tablet is a professional notebook for field trips. It's intended for intensive usage and those cases when you need not only ultra compact dimensions, but also additional functions (handwriting recognition in particular). This model enjoys all advantages of corporate notebooks (and IBM/Lenovo notebooks), including strict design, high ergonomics, reliability, and functionality. TabletPC functions successfully supplement these features. The main features of the X41 tablet is a very high level of reliability and ergonomics. The lenovo.ru web site is traditionally not working. You should either open lenovo.com, or ibm.ru/ibm.com, and then choose your country. The catalog of products is traditionally hosted at ibm.com. I again want to repeat that I failed to find specification of this model on the IBM/Lenovo web site by following links. I usually find a model number in a search engine (sometimes in third-party price lists), and then type this model name in a search field on the Lenovo web site. That's where appears the difference between the model number and part number (for example, the model number is 1866AAA, the ABCDEF part number will be displayed in specs as ABCDxx, so you naturally won't find it in search results. It's easier to find specs on Ebay, really!) It's sometimes difficult to find full specifications of a given model. 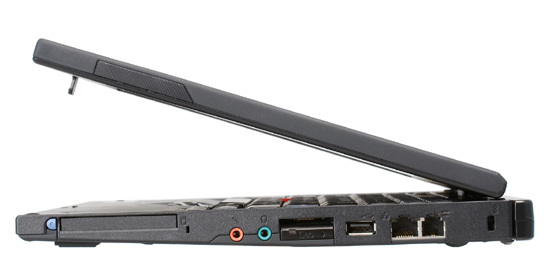 General characteristics of Lenovo Thinkpad x41 tablet series is published here. ThinkPad X41 Tablets possess a number of distinctive features. Being a part of the advanced X40 series, ThinkPad X41 Tablet is the smallest and light-weight 12" Tablet PC the offers extreme mobility and ultra-slim dimensions. The model can work as a tablet or as an ultra-slim notebook offering handwriting recognition with its Tablet Digitiser Pen. Weighing 1.61 kg, this tablet PC can work up to 6.3 hours in battery mode** - the best result among all 12" tablet PCs (the data are true for some models). 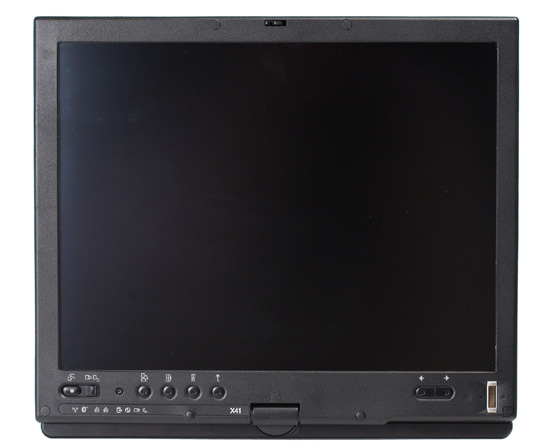 Impressive characteristics, which include Intel® Pentium® M processor for some models, full-size keyboard, Intel 915GM Express chipset, integrated PCI Express video, Secure Digital card reader, 1 x PC Card slot, provide outstanding performance in compact dimensions and low weight of a tablet PC. *The data are based on published info or CNET.com sales results that reflect sales of tablet notebooks from five leading manufacturers in Q1 2005 according to IDC. 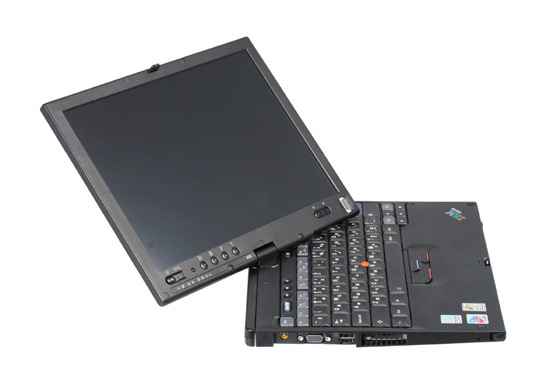 **Some models of ThinkPad X41 Tablet with an 8-element battery. The general list of models and description of the series are published on this page. It provides brief specifications of models from this series and a comparison table. There are no links to detailed descriptions. We should mention technical support. In brief - tech support is up to the mark! A user types a model number (you can type even a serial number of your notebook) and gets full information about it, including a complete list of updates of drivers and software! It's very convenient. The on-site list is conveniently organized. There is also a stand-alone highly configurable utility to download and install updates automatically. Everything is organized well here - simple, functional, the system wastes no time and does maximum good. Extra Thinkvantage security subsystem 2.0, other Thinkvantage technologies. Test results for reading 145 min. The results are quite standard for a model of this class. They are even good for X41 Tablet, considering that it's a Tablet PC and that its panel consumes more power. We should also note that you can buy a higher capacity battery for X41 Tablet, which will lead to longer battery life and larger dimensions. Amazingly, the keyboard of such a small computer as X41 Tablet completely copies the layout of large notebooks from IBM, only some side rows are narrow. However, these keys are wider than usual in large keyboards, so even narrow keys are convenient to use. The main alphanumeric keys are not modified, that's a huge advantage of this model. I've always felt inconvenienced by keyboards in 12" notebooks. So I always rolled back to "large" keyboards with pleasure, or tried to use external keyboards, if I had to type much. But in this case I had no problems with switching my usual notebook (also an IBM model) for X41 Tablet, it was almost more convenient! This notebook can be used by professionals, who do a lot of typing - the built-in keyboard will satisfy them. What concerns the keyboard layout, it copies the layout of larger notebooks from the same manufacturer. You can see that the side buttons are narrow (on the left and right), but they are still convenient to use. Besides, F-keys are slightly smaller than the others, so it's harder to hit them. But on the other hand, you won't use them blindly. There are no more changes. Tactile feedback is also close to optimal. The keys are pressed easily, but there is still good protection from accidental key presses. The keyboard is practically perfect. What concerns pointing devices, the X41 Tablet lacks a touchpad, so there is no alternative to the trackpoint. On the other hand, I got so used to its trackpoint and its keys for two weeks of testing, that I gave up using the touchpad on my notebook. X41 indicators are arranged like in other IBM/Lenovo notebooks. There are three indicators at the outer side of the display lid – network/battery status, idle, and Bluetooth. The other indicators are on the inner side of the lid under the display. You can see them well in notebook as well as in tablet modes. There are the following indicators: wireless network indicator (alight when the interface is busy, blinks during data transfers), Bluetooth indicator (ditto), Numlock, Capslock, HDD indicators, power on indicator, two-color power indicator (green – either working from a battery or from a power-line and the battery is charged, the indicator blinks yellow when the battery is discharged, charging battery – yellow. When the battery is almost charged, it lights green and blinks from time to time), idle indicator (blinks when the system goes to sleep). We have no gripes with visibility or signals provided by the indicators. 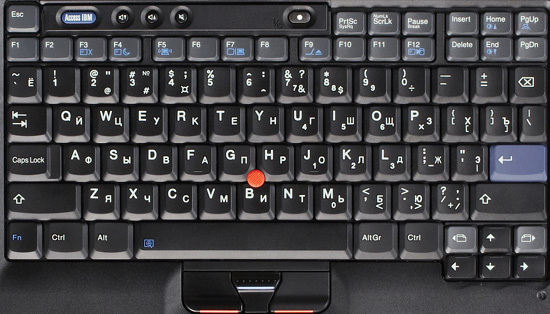 What concerns additional keys, the notebook mode offers volume control buttons (higher/lower/mute) and the standard Access IBM button. By the way, it should be noted that the Access IBM button in the new notebooks does not start a utility to configure some brand features. Now it's a sterling launcher. We'll describe it below in the section about IBM utilities. We should also mention the buttons in the display frame, which are used in the tablet mode. First of all, it's a duplicate of the power button. It's equipped with a protecting slider, which does not let press the button, when closed. So you can effectively eliminate any chances of turning the notebook off accidentally, when you work in the tablet mode. There is a small button above, which can be pressed only with a stylus. It acts like Ctrl+Alt+Del in Windows. It calls Task Manager, which can be used to remove a frozen task or process as well as to perform some other operations with the system. The button above rotates the screen by 90° each time you press it. The next button displays a special menu to control basic functions in the tablet mode. And finally, there are duplicates of Enter and Esc. There are up and down buttons in the upper part of the tablet. I'd like to note one inconvenience that has to do with these buttons. You evidently use them, when the notebook works in the tablet mode. It's more convenient to hold the tablet at the bottom. In this case it would have been convenient to put your thumb on the buttons, but… it lies near the power button and the screen rotate button. You have to reach the up/down buttons, which is inconvenient. The "top" of the device is right there (the proof is in labels). It's much more convenient to rotate the screen by 180° so that the up/down buttons appear right under your left thumb. So it will be convenient to scroll through documents. I'd also like to have pgup/pgdn buttons, they are more convenient for reading text than just up and down. The case is traditionally up to the mark, as always the case with IBM. All materials are selected well, they look expensive, they don't wear down in time (I speak from the experience of my notebooks). The case is assembled very tightly, there are no gaps, mismatches, or squeaks. It lies well in your hand, nothing sags, you are not afraid of damaging it. The panel frame is sturdy, it's impossible to damage the panel. The rotary unit is also very tight. Backlashes are highly improbable. I'd like to call your attention to a well thought-out cooling system – a fan is mounted on the side, vent holes are all over the notebook to ventilate the entire case. The left flank houses a stylus bay, a large exhaust grille, another USB port (a little port under it powers an optional optical drive for this model), VGA port, and a power connector. All connectors are installed on a recessed panel. That's why it's sometimes inconvenient to hold the notebook in your hands. The rear panel is fully occupied by a battery. You can install a battery of higher capacity without making the notebook look worse (it sticks out a little, but the outlines of the case are preserved). There are no ports or connectors on the front panel either. Unlike usual notebooks, the display lid has a different latch. 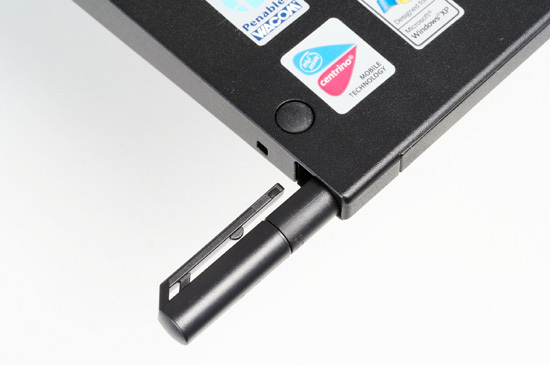 The latch itself is similar to those on many other tablet PCs - it's two latches that can slide out at any side and lock two parts of the notebook in any position. The slider that opens the latch is not on the display lid, but on the main unit. You have to get used to it. All connectors are placed at the sides. The right flank is standard – one PCMCIA slot, audio jacks (mike-in and headphones-out), a card reader and IRDA port, USB 2.0, modem and LAAN ports, Kensington lock. The case and connectors are very ergonomic, except one thing. The power connector is on one side, and the headphones-out is on the other. That is, if you want to watch a movie (you can do it with this notebook owing to the high-quality panel), wires will go out from both sides, and it will be impossible to put the notebook on its side. We should say a couple of words about the stylus. It's a counterpart of a pen, it's convenient to hold in your hand. There is a soft tip at one end (the bundle includes spare tips). The stylus has a button, which can be used as a right or middle button (it's a rocking button). But sometimes you mix them up. A whole bunch of problems should be solved to design an ergonomic display for a tablet PC. Requirements to a tablet display are much higher than for a notebook panel. First of all, it's angles of view. A notebook almost always faces its owner. You rarely have to look at the display from an angle. So insufficient angles of view are pardonable. At the same time, you have to look at a tablet PC from an angle very often (firstly, it's much more difficult to hold it strictly perpendicular to you eyes; secondly, if you put a tablet PC on a table, the angle of view will be approximately 40°), that's why TN-film panels are of little use here - too inconvenient for a user. The second problem is a stylus that users hold in their hands and use it to touch the screen. The hand that holds a stylus also rests on the panel. That's why a panel must first be covered by thick and firm protecting glass. Secondly, this glass will inevitably show greasy fingerprints. The X41 Tablet uses an IPS panel. As you may know, this panel type is notable for wide angles of view. And the screen remains readable almost at any angle. So there are no problems with reading from the screen. The brightness control range is very wide, but the upper limit is evidently too low for working under bright sunlight. This is probably done to save the battery. The protective layer sometimes reflects flares under large angles of view (especially if its dirty). But I take it as a peculiarity rather than a drawback, because it's hard to solve it. What concerns audio, there is only one speaker at the bottom. That is you almost always have to use external speakers or headphones. What concerns operating temperatures, the situation is not that peachy. If we enable maximal performance mode and load CPU with some resource-intensive task, the entire notebook gets hot very fast. It's sometimes unpleasant to hold it in your hands. So you should use it in moderate performance mode most of the time not to overload the cooling system. 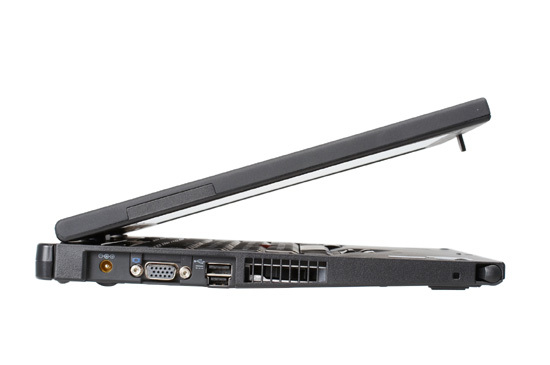 The notebook is almost always cold in this mode, but its performance is still sufficient for office use. You can hear the fan rotating in a quiet room at night. But the noise is very low and is not irritating. The noise of the cooling system dissipates in any external noise. As it was impossible to run tests on this notebook, we evaluated performance subjectively (reading – just a static picture with an MS Word file, load – browsing Internet via wireless (!!!) interface). Battery life is on a good average level. It's even good for a tablet PC with such a panel. But from the functional point of view, two hours may not be enough for a long business meeting. So if you work much in battery mode, you should think about buying a battery of higher capacity. IBM Thinkpad notebooks come shipped with lots of utilities, some utilities can be downloaded from the official web site. We cannot describe them all. I just want to note that it's the best bundle on the market in my opinion - it's not that the notebook is full of functions right after the installation, it offers a number of unique services, which can otherwise be obtained only by means of complex tricks (some of them cannot be obtained at all). As we have already noted, all utilities are grouped in a launcher - Thinkvantage productivity center. It can be used to perform some functions or to call configuration and support utilities (for example, to enable Access connections to connect to a wireless network). We should mention a special utility to open a list of main functions that can be configured in the tablet mode "with a single click". This utility makes operations with the notebook much more convenient. The most frequently used functions include switching the notebook to idle mode, adjusting volume and brightness, configuring the Tablet PC and stylus, managing wireless devices. You can also control other functions. The bundle includes a number of programs for tablet PCs, for example a notepad supporting stylus input, special games, etc. Besides, the bundle includes a full package of Tablet PC utilities from Microsoft and even a special game. Along with a full suite of utilities from IBM Thinkvantage, there is also Picasa 2, virtual drive (probably intended to make up for the external optical drive, which is not always convenient to plug in) and Zinio reader (for reading ebooks, which is also a useful program for a tablet PC). The notebook produces very nice impressions. Firstly, it's a notebook for work, no concessions made. You can work on it for a long time (you can even use it as a main notebook), without sacrificing much and feeling no discomfort. Secondly, the input devices are unexpectedly ergonomic. Thirdly, the tablet mode is also very convenient and expands functionality of the system. In particular, I don't like reading ebooks on a notebook. But reading them on the X41 in the tablet mode is a joy (as well as to play solitaire...). Besides, working with a tablet PC in a portrait mode is very convenient in many cases. Fourthly, this notebook is equipped with an excellent panel - one of the best in the market. If we take into account its dimensions and positioning, it's the best. Fifthly, it's a good reliable workhorse, which IBM is so notable of. I felt no performance difference between different modes and processors in the course of my tests (it's too low for office applications). So this notebook easily satisfied all my work requirements (including watching movies). The tablet mode is a good add-on to its functionality. It's one of the candidates for a main work computer. This notebook belongs to the X series, besides it has additional unique functions. So it will have matching buyers - professionals, who know what they need, how much it costs, and ready to pay for the required functions. But they will require high-quality implementation (for example, an adequate display). This notebook will be a good choice for professionals, who work much with computers, for whom ergonomics and functionality are more important than speed, and who need tablet functionality (many users will need it). Or people, who need tablet functionality, but want excellent ergonomics and reliability. Advantages of this notebook include a combination of notebook and tablet functions, dimensions and weight, excellent ergonomics (including the keyboard), excellent panel, wireless interfaces, a very good bundle of proprietary utilities. 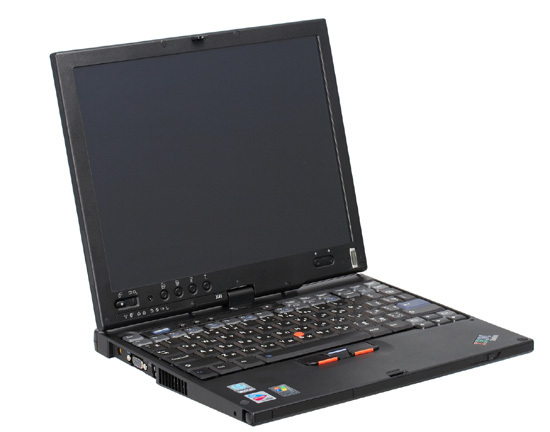 Speaking of drawbacks, we can mention the outdated configuration and mediocre performance (though this model has lower power consumption), and traditionally high IBM and Lenovo price (this notebook costs about $2000 without any options).